We can define the cool down as the moment we finish our main pieces of training that require extensive energy and mental acuity to complete. Once we’ve finished, we need to start transitioning our body towards “cooling off” and returning to homeostasis. From a physiological perspective, we are in a sympathetically driven state throughout our training sessions utilizing a wide array of stress hormones. As a result, we are not in an optimal state to grow, repair, or digest as blood is being diverted to the periphery to fuel our activity. So, once training has concluded, we want to start the recovery process as soon as possible to move our body back into a parasympathetic state where we CAN grow, repair, and digest food. Rowing, jogging, ski erg, versa climber have too much eccentric work within the movement to make them optimal tools for post workout blood flow. Stick to walking or easy pedaling on a bike where eccentric loading is minimal. This will also help move blood. Easy stretching post training is great for bringing awareness to deep breathing practice which activates the diaphragm thereby exciting the Vagus nerve bringing us into a parasympathetic state. The key here is “easy stretching” as we want it to be relaxing and calming. If it becomes too intense, we can actually elicit a stress response and negatively impact our recovery practice so be mindful of our post training mobility work. Rule of thumb, if you can’t talk or breathe easily then the position is too intense. Some gyms might have these tools which further help the recovery process by targeting lymph drainage and moving stagnant blood. Both valuable tools after a more demanding session where metabolites from metabolically intensive work are sitting in the tissues which can lead to tension and poor blood flow to those muscles in subsequent sessions. PWO is definitely a click bate topic for most of the sensationalized media. However, we can properly utilize this window to set ourselves up for success by starting the recovery process sooner than later. The first point, that goes without saying, prescription for PWO is “highly” individualized. 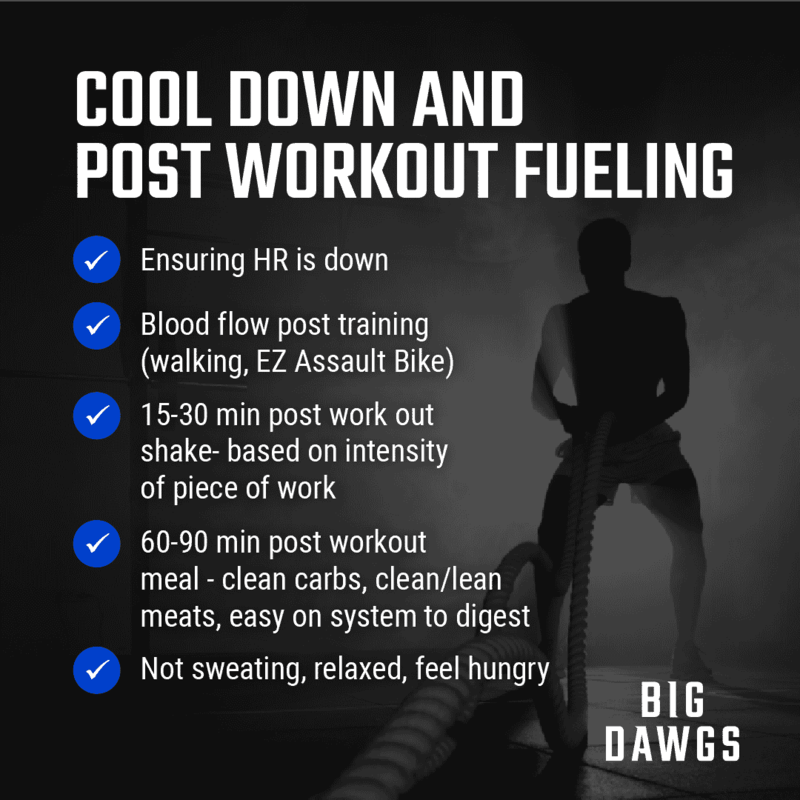 The athlete, their goals, their training program, the amount of training they are doing that day, their schedule, their ability to handle and digest certain foods all play a part in the prescription of an appropriate PWO protocol. So, instead of just listing what people should be taking after training I’m going to list great principles everyone can benefit from that will optimize their ability to utilize the nutrients they are intaking soon after training. If our heart rate and core temperature are too high, we will still be in a predominantly sympathetic state. As mentioned earlier, whenever we are in a sympathetic state our body will be diverting blood away from the core (think: gut) to the periphery (think: muscles). As a result, if we consume any food or other PWO, our system’s ability to effectively digest and assimilate that food will be severely compromised. By continually doing this, we can increase GI distress by building up undigested food particles impairing recovery and growth. So, to prevent this, the first step is to ensure we are calm, our heart rate has lowered significantly, we aren’t sweating and have a desire to consume food. Tying in to the point above, we need to be a bit more conscious with the food we consume post training as our bodies are in optimal states for absorption and fuel utilization IF we prepare those foods appropriately. For athletes who are training twice a day, fueling after the first session is imperative to provide nourishment for the body for the second session. If the second session is within 8 hours from the first, the athlete should begin refueling as soon as it is feasible to maximize the effective recovery time between sessions. *Worth noting, I prefer athletes who train doubles throughout the week to include powdered post workout shakes to help them consume enough carbohydrates for the day. For those who train once per day, I prefer majority of their macronutrients coming from whole foods.